The head of UNASUR and the foreign ministers of member states met Thursday night with President Lugo to analyze the destabilization attempts against his government. Rodríguez explained that UNASUR member states respect the sovereignty of Paraguay but that the problems concerning democracy in that country affect all of South America. He said he will meet with diverse political sectors in Paraguay to seek a peaceful solution to the conflict. Paraguay’s congress requested yesterday, with 76 votes in favor and 1 against, a political trial against the president to attempt to link him to clashes last week in Curuguatay in which 11 farmers and six police officers were killed. President Lugo will present his defense before Parliament at noon today. Afterward, evidence will be brought forward at 2:30 in the afternoon, allegations will be heard an hour later and sentencing will take place at 4:30. Vice-president Elias Jaua described the attempt by the Chamber of Deputies of Paraguay to topple President Fernando Lugo as a new attack sourcing from the bourgeoisie and the United States. During a ceremony to deliver resources to the state of Miranda, Jaua denounced the sectors trying to weaken the South American revolutionary process. “The battle of the Paraguayan people is that of the Venezuelans, and we are committed to thwart this new attempt by the oligarchies and imperialism as we did in Venezuela in 2002, and also when they tried to topple Evo Morales (Bolivia) and Rafael Correa (Ecuador),” he said. In Jaua’s opinion, it is all about the struggle of the peoples and governments so that the will of the peoples of the region is respected and about “letting imperialism know that our Latin America is no longer their backyard,” he said. “Here we have a people and a government ready to defend the sovereignty and independence of all the countries in the region,” stressed Jaua. The lower house of the Paraguayan Congress impeached Lugo on Thursday, and the Senate opened his trial on Friday and quickly reached a guilty verdict, ousting Lugo. Lugo was immediately replaced by Vice President Federico Franco, a ferocious opponent of the leftist leader. Franco was sworn in as the new president of Paraguay on Friday evening. “Although the law’s been twisted like a fragile branch in the wind, I accept Congress’ decision,” Lugo said in a speech on national television after lawmakers found him guilty of performing his duties badly during a land dispute that left 17 people dead. After a five-hour trial, 39 senators voted to oust Lugo, while four senators voted against the motion, and two were absent. He was accused of mishandling an armed clash over a land dispute in which seven police officers and ten landless farmers were killed on June 15. Earlier, Lugo had said the entire impeachment process was equivalent to a coup. “It is more than a coup d’etat, it’s a parliamentary coup dressed up as a legal procedure,” an angry Lugo said on Paraguayan radio. After the Senate announced the decision, several thousand Lugo supporters took to the streets to condemn the move and express support for the man they still view as the president of the country. Police fired tear gas and rubber bullets and used water cannon to disperse the protesters. The breakneck speed of the impeachment process raised concerns in other South American capitals, and a few dispatched their foreign ministers to Asuncion. Some countries even warned of the possibility of imposing sanctions on Paraguay. Ecuadorian President Rafael Correa announced that his government would not recognize Franco as president. BETHLEHEM – A group of veteran Israeli soldiers who served in the West Bank and Gaza Strip have spoken out on camera about their experiences in the army. The Israeli organization Breaking the Silence has collected testimonies from 800 veteran Israeli soldiers who served in the West Bank and Gaza. In a new campaign, it has released video testimonies of six former soldiers describing their experiences. Amit served in Ramallah, Hebron and the northern West Bank during the second intifada. He describes an incident in which an Israeli commander swung his rifle at the jaw of a Palestinian during a tense situation at a roadblock near Jerusalem. He says witnessing first hand what goes on the West Bank shattered his worldview. “Going from a place where I was sure that we are the scapegoat, the miserable ones being killed, I saw a reality that, most of the time, was the opposite. Yehuda Shaul, one of the founders of Breaking the Silence, says he did everything he was required to as a fighter — and later a commander — in the Israeli army. He says the most memorable part of his service was watching Palestinians getting beaten up by settlers in Hebron, while under orders not to touch them. Another soldier, Sagi, who also served in Hebron, recalls a procession of Israeli children burning an effigy of a member of the anti-settlement organization Peace Now. Sagi says he finds people prefer not to listen to his experiences of the army, and those that do listen think that his experience was isolated, and perhaps he was “a soldier who transgressed” and should be put on trial. “Maybe I really should be put on trial – but if I need to be tried, as one of the humane soldiers who served in the territories, I guess we should try all Israeli soldiers,” he says. Yael served as a scout in Gaza, monitoring a live video feed of the Gaza border. The soldiers shot a sheep. “Seeing it from the other side, it was like a video game, so detached from reality. So what if we shoot animals. In other testimonies, a soldier describes an incident in which a company of soldiers, including the battalion commander, assaulted a detained Palestinian. A soldier in an elite unit recalls an officer being ridiculed for not following an order to shoot an elderly, sick Palestinian who had gone back into his home to get his medication during an arrest raid. In most languages the terms “liberty” and “freedom” are interchangeable, but there is a fine distinction. Freedom is more general, implying simple exemption from any control or influence by another person or agency; liberty implies laws, a system of order and restraint. One might say that liberty is the freedom to obey the rules. Benjamin Franklin knew better, but that didn’t stop him from saying that people willing to give up freedom to gain security will not have, nor do they deserve, either one. In his speech to the Virginia Convention on March 23, 1775, Patrick Henry concluded with, “Give me Liberty, or Give me Death!” So let’s go from here with the term, liberty. Especially since 9/11, our liberties have been under savage attack. The Constitution is strafed and bombed as the US is marched toward a fascist police state—even torpedoed by much the same forces that labor to cover up the attack on the USS Liberty back on June 8, 1967…. The world’s most sophisticated intelligence ship, the USS Liberty was a $40,000,000 Signals Intelligence platform (SIGNIT) with a crew of 294. About 6 am local time, an Israeli reconnaissance plane spotted the USS Liberty just outside Israeli coastal radar. Throughout the day, more Israeli reconnaissance planes flew out and orbited the ship at least eight times altogether. Meanwhile, the flight officer who originally spotted the ship teamed with an air-naval liaison officer at Israeli air force headquarters, and they consulted Janes’ Fighting Ships. At 11:00 am they identified the ship as the USS Liberty. At 2 pm Israeli fighter jets attacked the USS Liberty, initially targeting the command bridge, communications antennas, and the four .50 caliber machine guns placed to repel boarders. After those fighters spent their ordnance, consecutive new waves engaged, adding napalm to the rocket and 30 mm cannon fire. Intense radio jamming contributed to stifling the Liberty‘s calls for help to the Sixth Fleet in the Mediterranean. Thirty-five minutes into the air attack, fighters disengaged. Three Israeli torpedo boats closed in for a surface attack, launching five torpedoes—one struck the Liberty opposite its research spaces. The torpedo boats then moved up and down port and starboard, raking the ship with cannon and machine gun fire, targeting anyone who came above decks, destroying firefighting equipment and life rafts. The Liberty’s defenseless crew eventually patched different systems together and got a distress message through to the Sixth Fleet. The USS Saratoga and USS America both launched fighters to aid the Liberty; the message for them to destroy the attackers upon arrival was sent “clear” (not encrypted). The torpedo boats suddenly broke off their attack and began radioing the USS Liberty, asking if she needed assistance. An Israeli naval officer notified the US Naval Attaché at the embassy in Tel Aviv, and apologized for Israeli forces mistakenly attacking an American ship. Then for the first and only time in our history, rescue aircraft were recalled before arriving at the attack site…. So, 17 miles off the coast of Gaza, after eight hours of aerial surveillance, Israel attacked the USS Liberty for two hours, killing 34 and wounding 173. Besides the torpedo and napalm damage, 861 holes the size of a man’s hand and larger were counted, plus thousands of .50 caliber machine gun holes. The SIGINT platform was so damaged the ship never again sailed on a mission. The USS Liberty was sold as scrap for $102,666.66. Israel freely acknowledged that the ship was American, had remained in international waters; and claimed they never made positive identification before attacking. Secretary of State Dean Rusk sent a letter to the Ambassador of Israel stating that we expected them to take disciplinary measures as required by international law, and that was it. There were no disciplinary measures—at least not in Israel. Closing off the affair was a rushed and phony American inquiry into the attack, plus threats to surviving crew members of “court-martial, imprisonment, or worse” if they exposed the truth. Perpetual pressure from the pro-Israel lobby in our country has kept this the only serious naval incident never to be investigated by Congress. To this day no surviving crewman has been allowed to officially and publicly testify about the attack. In 2005, a request was issued to the Secretary of the Army, as Executive Agent for the Secretary of Defense, regarding investigation of war crimes committed against U.S. Military personnel, on behalf of the USS Liberty Veterans Association, Inc. High-level intrigues trumped the request, kept the top-secret lid welded over the truth. What happened to the USS Liberty seems an excellent metaphor for what is happening to the liberty of Americans. Though torpedoed by the NDAA (National Defense Authorization Act for Fiscal Year 2012), the Constitution still floats. Will it be sold as scrap, like the USS Liberty? The NDAA torpedo, with its warhead of provisions regarding indefinite military detention of anyone, without charge, nearly blew away the Bill of Rights. A green light for government to disappear American citizens? Sure, “suspicion” of some kind of “connection” with a terrorist group is a requirement for being disappeared, but the suspicion can be anything, even nothing but a whim, even nothing at all. The bottom line of the NDAA, beneath all the specific and carefully-worded incoherence: If there is something the government does not like about a citizen, whatever rights they might’ve still had are gone. But just when it seemed the Constitution might sink in terms of protecting citizens from corporate government out of control, good news floats from the courts, blocking the NDAA—for now at least, pointing toward future missions? With such extensive damage, perhaps the only hope for the USS Constitution is dry dock, massive repairs, and further protection as the NDAA rises toward the Supreme Court. Meanwhile, Congress and the Obama administration keep circling the remains. Rand Clifford’s novels Castling, Timing, Priest Lake Cathedral, and Voices of Vires are published by StarChief Press, and will be available soon as e-books. The story of a small community of Afrikaners who converted to Judaism, moved to the Holy Land and made their home on a settlement deep inside the West Bank, on land contested by a Palestinian family living nearby. For South Africa’s Carte Blanche. RIO DE JANEIRO – He was on a flight to the biggest international summit on environment in a decade when Kenyan indigenous rights activist Peter Kitelo’s attention was suddenly drawn to a government advertisement. It called for national and international investors to put funds into “forest development”. Kitelo could not escape the irony. Here he was, on route to the Rio+20 U.N. Conference on Sustainable Development, and he was looking at yet another assault on the livelihoods and very existence of indigenous communities. 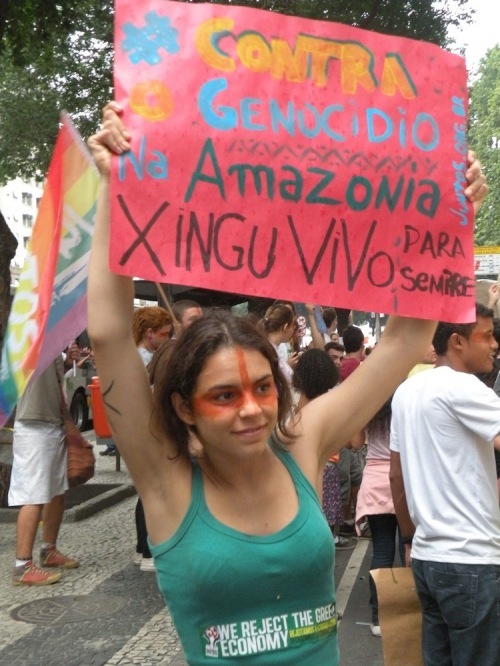 “Sustainable development is not really sustaining my people,” Kitelo told TerraViva in Rio. He said that forest communities like his and in other East African countries such as Uganda and Tanzania are discriminated against by central governments and policy-makers who determine the future of their native lands. “We are being left out, no one talks to the right people in our communities,” he said. When plans are laid for land development, they are advertised in newspapers and other media, to which native tribes hardly have access. Only when the plans are reaching their final stage will officials come and hold short meetings in villages, which Kitelo says are more an effort to satisfy donor requirements than a genuine effort at engagement. “Then, even before we know it, our land is not ours anymore,” he said. Kitelo cited the example of forest development for tourism. The concept talks about preserving the forests, but in the process prevents his people from using the forest. “The whole concept of forest conservation does not allow human interaction, but that is what my people have been doing for generations,” he said. The Kenyan experience is hardly unique. All over the world, indigenous communities complain that they are being left out of the decision-making processes on their own land. Laura George, from the Amerindian Peoples’ Association of Guyana, told TerraViva that when new land laws were to be introduced in June 2009, there were no consultations with the indigenous people at all. A year later, a final document was produced. Government officials attending the Rio conference held a side event and claimed that indigenous populations were in fact consulted. “When I informed them they weren’t, the officials were not happy, but that is the truth,” George told TerraViva. This type of discrimination can lead to indigenous communities losing their way of life completely. “While governments are coming to Rio to talk about sustainable development, in my country, Peru, the pressure is growing day by day from policies of the national government that seek to open up our remote forest territories to transnational companies through road infrastructure projects,” said Robert Guimaraes Vasquez of the Shipibo people in the Peruvian Amazon. Activists said that even in Rio, indigenous groups faced discrimination, with logistics preventing them from gathering together. “One group is here, another group is 40 km away. How can we form a common front? We are so far apart here,” George said. Still, conferences like Rio+20 do offer at least small avenues where indigenous groups can bring their problems to a wider and influential audience. George and Kitelo both told TerraViva that if governments remain deaf to their concerns, they will seek action within international bodies. “That could be our last resort,” George said. Paraguayan leftist President Fernando Lugo has said he would not resign after the opposition-controlled lower house of Congress voted for his impeachment over last week’s land clashes with farmers. President Lugo pledged on Thursday to stand and fight the impeachment proceedings led by his congressional rivals over a land eviction in which 17 people died. “This president announces that he is not going to present his resignation and that he will fully respect the constitution and the law to face the impeachment trial and its full consequences,” he said in a televised speech right after the vote. After the lower house overwhelmingly approved the move, the Senate, which is also controlled by the opposition, followed suit, announcing the impeachment hearing will begin on Friday. Seven police officers and nine landless farmers died in a clash on last Friday, when police attempted to forcibly remove peasants from the farm, which is owned by a Colorado Party politician opposed to President Lugo. Right after the incident Lugo replaced his interior minister and national police chief. He also said on Wednesday that he would set up a committee to investigate the deadly clashes. Lugo, who took power on pledges to champion the poor, accused his rivals of planning to “rob the people of their supreme decision” when they elected him in 2008 to put an end to six decades of ruling by the right-wing Colorado Party. Under Paraguay’s constitution, if Lugo is booted from presidency, his vice president Federico Franco will replace him. Franco is the leader of Authentic Radical Liberal Party that formed a coalition with Lugo after the elections. The next presidential election will be in April 2013. Lugo, who was under cancer treatment, earlier said that he would not seek another term. On the one hand it attempts to be a serious human rights organization. But it has a Jekyll/Hyde identity as a rough-and-tumble agitprop street theater group featuring giant puppets acting the part of Mahmoud Ahmadinejad and various other Middle Eastern tyrants like Bashar Assad and Muammar Gadhafi. None of this would be out of bounds… until you examine the product of Iran180′s street theater. In 2011, it hosted a float at San Francisco’s Gay Pride parade in which Ahmadinejad was sodomized by a nuclear missile. During the same event, Ahmadinejad fellated said missile. Last year, during UN demonstrations coinciding with the Iranian leader’s UN General Assembly speech, the group featured a gay Jewish wedding between Ahmadinejad and Assad in which they stood under a chuppah and broke a wedding glass. In another scene, the lovebirds take a drive in a horse-drawn carriage and one strokes the naked belly of the other. Freedom-loving people know what we want to see in Beirut, Damascus and Tehran: the central square bursting with citizens demanding an end to tyranny, massive strikes shutting down the national economy, the disintegration of security forces charged with maintaining order, and the consequent departure of the tyrants and the beginnings of a popularly elected government. A Turkish warplane has reportedly crashed in Syrian territorial waters with no reports about the fate of the two crew members on board. According to Turkish sources, the military lost radar and radio contact with the F-4 plane on the Mediterranean after it took off from Erhac Airport in the eastern province of Malatya, which borders Syria. The military has also said that Ankara was in contact with the Syrian authorities to get permission to conduct a search for the airmen. Some reports, however, suggest that the jet may have been shot down.